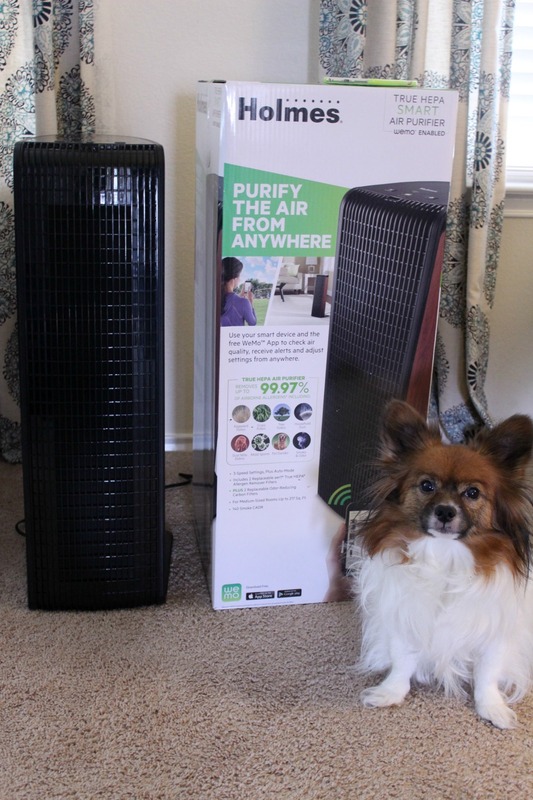 This is a sponsored post written by me on behalf of Holmes® Smart Air Purifier for IZEA. All opinions are 100% mine. This giveaway is CLOSED. 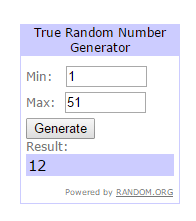 The winner has been chosen! Comment #12. When it comes to keeping the air in our home pure and clean, I have several things working against me. For one, I live in Austin, TX – one of the allergy capitals of the world. Two, I have a dog. Hello lovely pet dander. And three, we live in a world with airborne allergens and that’s just the way it is. How can you keep the air inside your home healthier for your family? 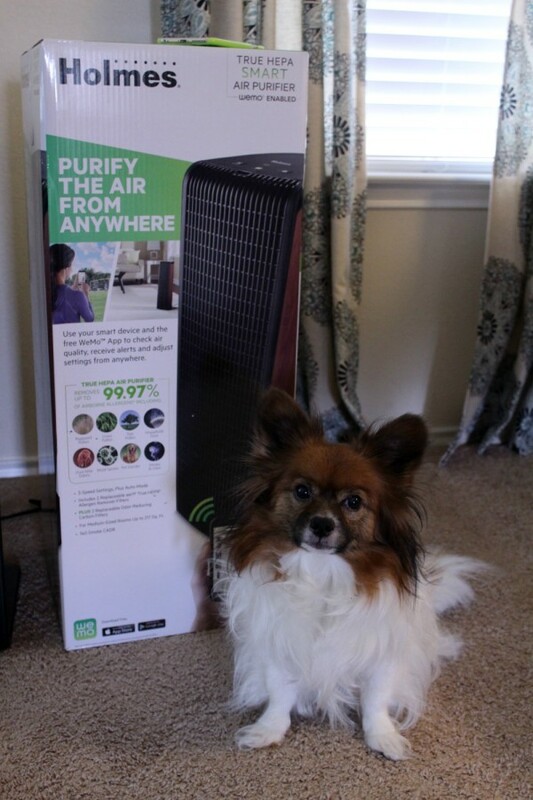 With an air purifier (Isn’t my model cute?). 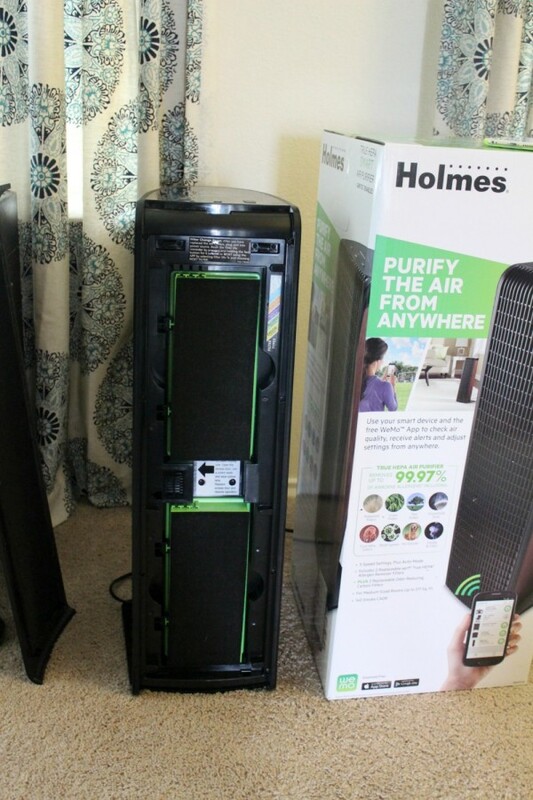 I recently teamed up with Holmes to test out the Holmes® Smart Air Purifier. I don’t often do just pure product reviews, but I have been so incredibly impressed with this product I had to tell you about it. I’ve heard about air purifiers and thought they sounded pretty cool, but not something I really needed. Until my husband started suffering from horrible allergies and asthma. Three sinus surgeries later and you can bet I’ll do anything I can to keep the air in our home as healthy for him as possible. Let’s start with how easy it was to set this up. In fact, I didn’t even set it up. The box arrived on my doorstep and my 15 and 11 year old sons set it up from start to finish. I was cooking dinner. Now if I can just get them to cook dinner while I sit on the couch with my feet up. Once step at a time right? 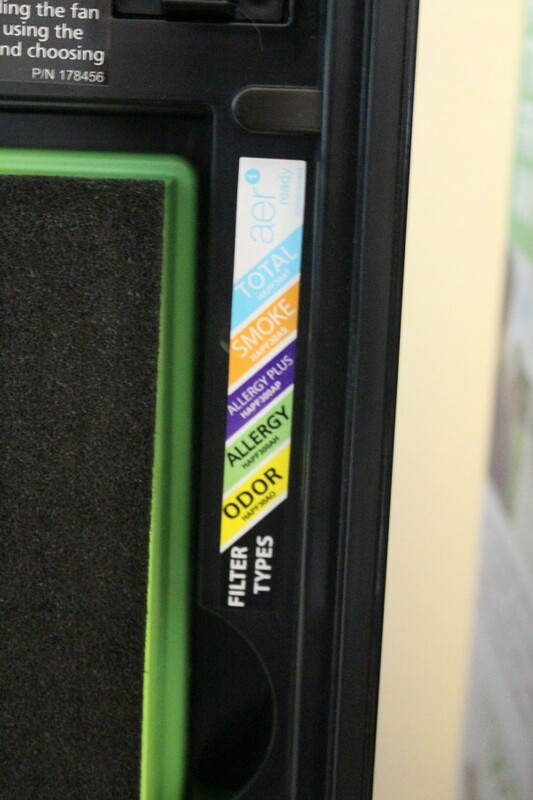 To set up, you open the front cover and attach the two replaceable True HEPA Allergen-Remover filters. Next, it’s time to download the WeMo app. Again, this was very self-explanatory on how to set it up and within minutes, we were running and operating our air purifier from my iPhone. 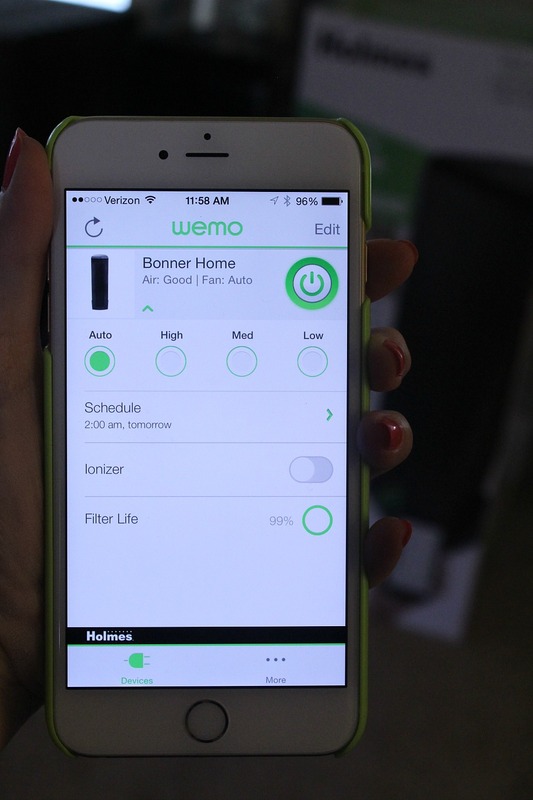 The WeMo app allows you to control your air purifier from any room of your home, using your smart device. The other night I was laying in bed scrolling through Pinterest and remembered I wanted to set a schedule for the air purifier. So I opened the app, set up a schedule and was good to go. You can turn it on and off, adjust settings and check air quality. The WeMo app will also alert you when it’s time to change the air filters and you just order them straight from your smart device. This, my friends, is your home + technology at its finest. Purifying the air in your home sounds great and all that jazz, but you want to know if it really works right? I can say without a doubt that I believe it does. I’ve not only noticed less dust on the surfaces of my furniture, but the air in our smells and feels cleaner. I usually have to dust every other day, but I went five days without having to dust my living room – which is filled with black furniture. When it’s dusty, me and every visitor in my home can tell. One of the downfalls of black furniture, but I still love decorating with it! Being able to operate our air purifier from my device is a WeMoment for me. What’s a “WeMoment” you ask? It’s that feeling of relief in being able to use technology to manage your home. Whether you’re operating an air purifier, your crock pot or a number of other WeMo-enabled smart devices, combining technology and managing your home is amazing. Speaking of amazing? 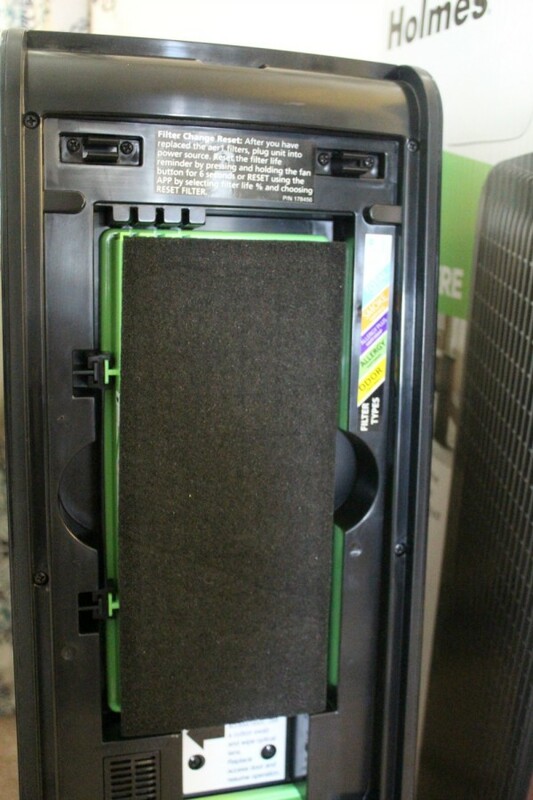 How would you like the chance to win your very own Holmes® Smart Air Purifier with WeMo®? To enter, please comment via the comment section and tell me this: “What’s something in your home you would love to operate via your smart device, giving you your own little WeMoment?” For me, it would be my dishwasher because I ALWAYS seem to forget to start it until after I’m in bed. Previous articleSpring Closet Organization Ideas: Let’s Clean Out That Wardrobe! I would love to operate my thermostat via my smartphone. That would be great so I didn’t have to constantly get out of bed or get up from the couch to change it..
Is it too much to ask to push a button and have my laundry transfer itself? :). I would like to be able to open and close my windows. Right now my thermostat since it got so hot so quickly. I’d love to control the thermostat with an app. It would make things so much easier and I could cool the house or heat it up even when we aren’t home so it’s perfect for when we return. I would love to operate the dishwasher. I would like to be able to control the thermostat with my phone so I could be comfortable at night without getting out of bed. I would like to operate the slow cooker with our smart phone. I would like to open/close our windows. We don’t have AC, so when it is starts cooling off on a hot day I’d like to open them up! I would like to be able to operate my garage door. I always think I forget to close it! I’d like to control the thermostat which would be really convenient. I would love to operate my dishwasher and washer and dryer. I would love for it to operate my window air conditioning unit in my bedroom. I am going to have to go with Dishwasher also. I am either in bed or at work when it pops in my head that I forgot to turn it on. I would like to be able to set my thermostat. I would love to operate my washer and dryer from my smart phone! Diaper changer. Someone, please invent a smartphone diaper changing app! Mine would be the alarm clock. I have it across the room so that I have to get up in the mornings to turn it off and I forget to set it until I’ve already laid down. I’d like to be able to turn on/off my computers. I’d like to be able to operate my coffeemaker with my smartphone. I’m sure my husband would love to turn on the coffee maker in the morning with his phone! I do not have a smart phone. But, I would like to work my thermostat if I had one. I would love to be able to lock/unlock my doors from my phone! I would like to operate my slow cooker by wifi. I often get something ready to cook in it then realize I forgot to set it and turn it on. I wish I could operate our air conditioner/heating with my phone. I would like to operate my air conditioner with my smart phone. I would like to be able to operate the air conditioner in our bedroom with an app on my phone. We start out with it on at night but sometimes it gets too cold and then I have to get back up. My second choice would be our thermostat because we usually turn it down or off at night since everyone is in their bedrooms. I would like to operate my coffee maker with my smart phone. I’d control the thermostat since we’ve starting to have hotter days around here. It would have to be my thermostat in the event of weather changing. I’d like to control the coffee maker. i would love to control water temperature for my bathroom so it can be ready before entering to shower some times is to cold or to hot.. I would love to operate my thermostat through my smart phone because it would help save money and we would be able to turn the air down on our way home so the house is cooled off by the time we get there.